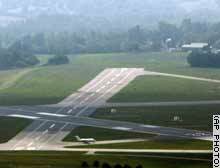 Are terrorists shortening our nation's runways? The recent crash of a commuter airplane has raised new questions about the safety of our nation's airports. The pilot of Atlanta-bound Comair flight 5191 appartly took off from a runway approximatley half the length required for his Bombardier CRJ-100 commercial jet. 49 of the 50 people onboard were killed. The department of homeland security responded by saying that terrorism has not been ruled out as a contributing factor in the crash and that short runways will no longer be allowed at any U.S. airports. All runways nationwide, regardless of airport or airplane size, will be refitted to accommodate planes of at least 747 size. The manager of Rantoul Field, a small general aviation airport in central Illinois, said in a statement that he applauded the move and that it would "give the kids a lot more space to race their go-karts". The 50 billion dollar project will begin next month and will be funded through cuts to federal education, healthcare, science and welfare programs.